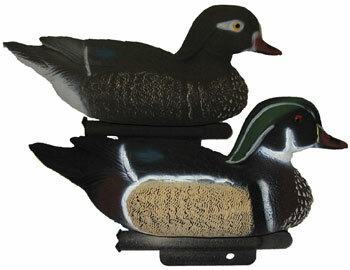 Avian-X presents their newest series of true, custom-style painted Wood Duck decoys. 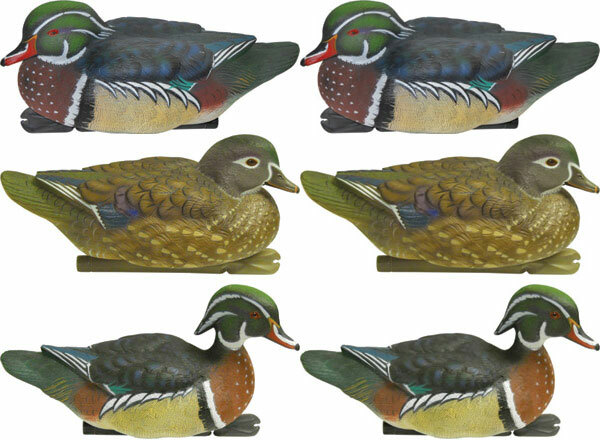 We have worked many hours researching, photographing and carving these true masterpiece carvings that capture the true beauty of Wood Ducks. We not only captured the beauty and grace of the Wood Ducks, but also the personality and posture that they possess when resting on the back waters. Couple that with the advanced rubberized molding material and non-chip paint and you have the best of the best. 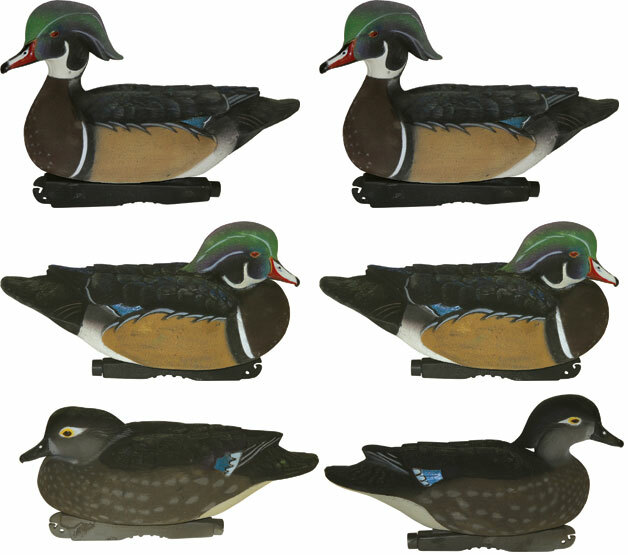 The Avian-X Topflight Wood Ducks are available in 6 packs that include 4 drakes (2 high-heads and 2 low-heads) and 2 low-head hens. All Topflight Series decoys feature the innovative weight-forward swim keel design, simply snap the line through the swim clip creating a natural motion to the decoys, whether in current or in the slightest breeze. Decoys are slightly over-sized measuring 12.5" breast to tail. 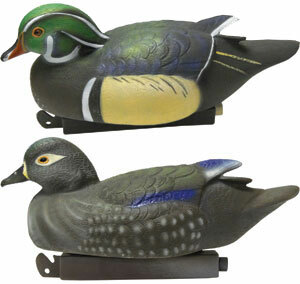 Carved by National Award winning carver Dave Van Lanen, these new Storm Front Wood Ducks are a magnum size woody! When you are hunting wood ducks, it is typically in some sort of timber, slough or marsh with vegitation making decoys less visible. A magnum size decoy is a true advantage in this type of situation. 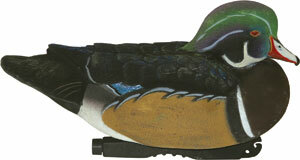 The New Storm Front Wood Ducks feature a long list of innovation only found on Storm Front Decoys. Every box includes (2) Active Drakes, (2) Rester Drakes, and (2) Semi-Active Hens. An innovative keel design includes center tie points allowing for added motion on light wind days. Depth adjusting eyelet allows for hunters to change water depths without excess decoy line. Secure strap weight location ensures an easy set up and tear down. The paint schemes were also developed utilizing Patent Pending UVision Technology matching the reflectance of real feathers in the full range of light visible to waterfowl, including Ultra-Violet. 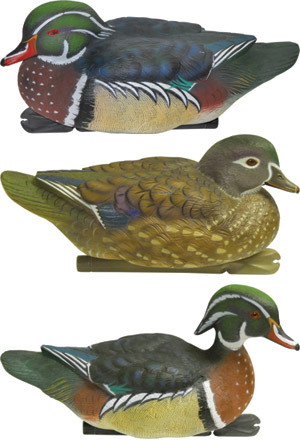 These Sport-Plast Weighted Keel Wood Ducks are the perfect decoy for those who want a Wood Duck that is true to size. 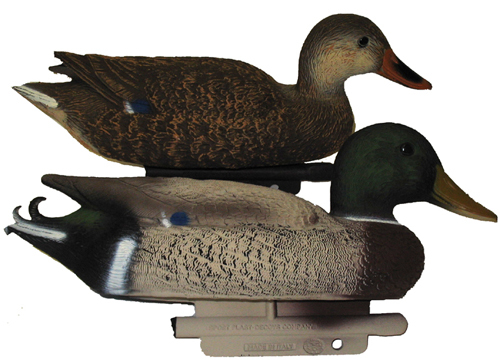 These decoys measure 11" from breast to tail on both the Drake and the Hen. These decoys are packaged 6 drakes and 6 hens per dozen.